Microsoft announced that Windows Insider Hub will no longer work. The company will not publish any content to Insider Hub. Feedback Hub has now replaced Insider Hub after the release of Windows 10 Anniversary Update. With the release of Windows 10 Anniversary Update, all Windows Insider Rings have moved to build 14393. With this change, we will no longer be publishing content to Insider Hub which is now replaced by Feedback Hub. 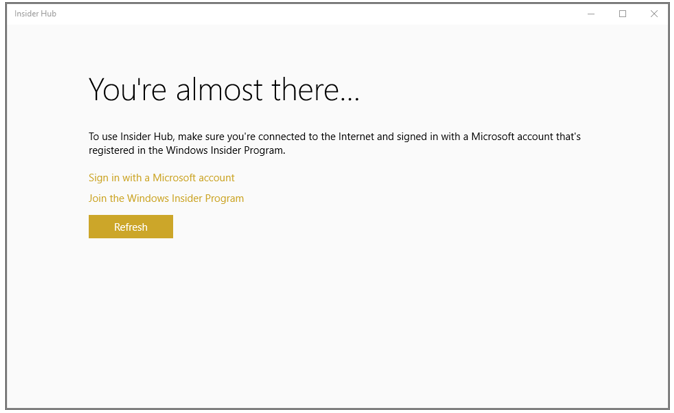 Starting today, you will not be able to sign into Insider Hub to view Windows Insider content. You will see the dialog below when you launch Insider Hub on Windows 10 build 10586 and lower and even if you do sign in, you will be brought back to the same dialog box. To keep up-to-date with Insider News, please upgrade your build to the latest Windows 10 Insider Preview builds.